A competent reverb that may have missed a trick by not offering more varied options. 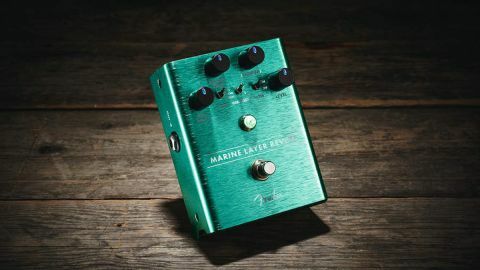 Unless it’s specifically a spring emulation, the modern reverb pedal has to feature several reverbs to compete and that’s the pattern that the Marine Layer follows with six reverb types - three algorithms (Hall, Room and Special) with two variations of each (1 and 2). There are knobs for Pre-Delay, Reverb Time and Level plus a Damping knob that attenuates the high frequencies alongside a Filter switch that can be used in conjunction with it. The two Hall variations offer the largest reverbs while there are also two rooms, one representing a standard-sized space, the other something more tightly defined. The Special settings offer more modern treatments. One is a shimmer reverb with octave shifting, the other features modulated reverb, both giving the impression of a shifting cushion of ambience. It’s all good but we’d rather have a spring and plate simulation in place of the extra room and hall.